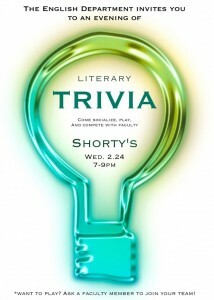 The English Department invites you to an evening of Literary Trivia. Come socialize, play, and compete with faculty. Want to play? Ask a faculty member to join your team! For more information, email Professor Omaar Hena.